MARCH 2018: The Fashion Show for All Abilities is on hiatus due to eliminated funding for the Waisman Center Community Training and Consultation program as Dane County adult DD services transition to state-run Family Care/IRIS/Partnership programs. ting. The scope of this Fashion Show has grown by leaps and bounds since then. With this event, we hope to change attitudes, promote inclusion, and grow self-esteem and confidence in the models themselves. Models in the fashion show come from every walk of life, and models with and without labeled “disabilities” are encouraged to participate. The idea behind the Fashion Show for All Abilities came from a young woman named Chantel Brown who had wanted to be a model from a young age. Early on, Chantel developed portfolios to showcase her talent and abilities. Several years ago, she suffered an anoxic brain injury. She now relies on a wheelchair to get around – and she hasn’t let this stop her from pursuing her dream. 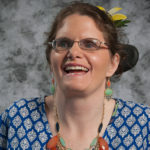 In 2007, Chantel rallied help from her friends, loved ones, and the Waisman Center to organize the first ever Fashion Show for All Abilities in Madison. In the past 11 years, 375 men, women, and children of all ages and abilities have been given a chance to experience a taste of Chantel’s dream. These models have worked with over 70 retail outlets, and met with countless salespersons, stylists, photographers, media, volunteers, and other community members. For many models, this event is one of the major highlights of the year. With an average audience of 500 people each year, the goal of the event is to reach a broad range of people to change attitudes and support inclusion in the community.